DUI FOR FORMER CANDIDATE: Charlene Cutler-Ploss, a member of the Eureka Design Review Committee and Redevelopment Advisory Board and a former City Council candidate, was arrested May 1 on suspicion of driving under the influence, Eureka police said. Cutler-Ploss, 38, who was reportedly returning from a Planned Parenthood fund-raiser with Councilman Chris Kerrigan, was in the driver's seat of a Volvo at 12:08 a.m. in the 800 block of Henderson, police said. The parked car, which was running with its lights on, attracted the attention of a neighbor, who called police to report a "suspicious vehicle." The officer who responded to the call spoke to Cutler-Ploss and subsequently arrested her, whereupon she refused to take breath or blood tests, police said. That refusal earns Cutler-Ploss an automatic one-year suspension of her drivers' license by the Department of Motor Vehicles, beginning in 30 days, police said. ARRESTS IN MURDER CASE: Two men were arrested earlier this month for killing suspected prostitute Lori Ann Jones, 38, of Eureka, whose body was found by hikers in Grizzly Creek State Park on Sept. 28, 2004. Delbert Leslie Miller, 61, and Steven Wayne Comarsh, 43, were arrested May 2 at the apartment they share in Old Town Eureka and booked into the Humboldt County Jail on suspicion of homicide. Following their arrest the apartment was searched and police found more evidence linking the men to Jones' murder, according to the Humboldt County Sheriff's Office. Both men pleaded not guilty to one count of first-degree murder with special circumstances last week. Miller, who will be represented by the county public defender's office and Comarsh, who will be represented by the county's alternate counsel, will be in court again May 19 when a preliminary hearing will be set. The men are being held in jail on $1 million bail each. PALCO FINANCES DEBATED: Local environmental groups last week trumpeted a damning new study of the Pacific Lumber Co.'s finances that was released late last month by the State Water Resources Control Board. The report, written by state board staff member Michael Gjerde, concludes that the company's dire financial situation is largely a result of the business plan imposed on it by its corporate parent, Maxxam, Inc. "Palco and [its subsidiary] Scotia Pacific are in financial trouble," writes Gjerde, a professional geologist with a master's degree in economics from UC Davis. "They are losing money and may have to restructure their operations. This condition is a result of the risky business model that Maxxam has chosen to follow for these companies." In particular, Gjerde underlines the fact that the company has paid down very little of the $750 million debt loaded onto the company during Maxxam's leveraged buyout of Palco 20 years ago. Chuck Center, Palco's director of government relations, last week questioned the water board's decision to assign the analysis to a member of its own staff -- especially one whose primary work is in geology. "If they were sincere, they would have a third party -- maybe an accountant -- do the analysis," he said. "That's about all we have to comment on it." The water board's study was commissioned to analyze company claims that regulation of logging in Freshwater and Elk River threatened to put the timber giant out of business. VICTIM PROGRAM THREATENED: Humboldt County's Victim/Witness Division, a program of the District Attorney's Office, may soon be forced to close its doors due to the loss of a key grant from the Department of Justice. On Tuesday, the Board of Supervisors decided to put off until next week a decision on whether or not to lay off four employees and effectively shutter the department, which provides assistance to an estimated 500 victims or witnesses of crimes each year. Deputy DA Wes Keat told the board that his office assumed that since the grant was not renewed, the program would have to be closed and the four employees laid off on July 30, when the grant expires. However, board members hoped that funding for the service might somehow still be arranged. "It's not really the end of the road as far as we're concerned," said Supervisor Bonnie Neely. The program provides legal assistance to crime victims in court and helps people apply for grants from the national Victims of Crime Fund. PEPPER SPRAY BAN SOUGHT: The plaintiffs in the recently concluded pepper spray lawsuit will ask federal Judge Susan Illston to issue a ban on the use of the agent against nonviolent protestors, according to a report in Monday's San Francisco Chronicle. Reached at his office Tuesday, William Simpich, one of the attorneys representing the plaintiffs, said that the Chronicle's story was correct but declined to provide further details. Late last month, a jury found that officers from the Humboldt County Sheriff's Office and the Eureka Police Department used excessive force when they swabbed pepper spray into the eyes of forest activists in 1997. ARCATA TAKES STAND ON IRAQ: After months of discussion, the Arcata City Council last week voted 3-2, with Mayor Michael Machi and Councilmember Mark Wheetley dissenting, to approve a city resolution condemning "federal lawlessness" associated with the war in Iraq. The resolution, which declares the war "illegal," "immoral" and "based on lies," has engendered a significant amount of opposition in the city's business community, among others. The Arcata Chamber of Commerce's board of directors voted to oppose the resolution after a survey of its members showed that 68 percent of respondents thought that similar resolutions over the years have had a negative impact on their businesses. The resolution was sponsored by Councilmember Dave Meserve. LOST COAST BREWERY SUED: Eureka's Lost Coast Brewery has been sued by a Bay Area man who claims that the label for the brewer's Indica India Pale Ale -- which features the elephant-headed Hindu god Ganesh quaffing a mug of the product -- offends his religious sensibilities. According to the Contra Costa Times, Brentwood resident Brij Dhir, a law student at Golden Gate University, is asking for $25,000 in damages in the lawsuit he filed in Contra Costa Superior Court. Lost Coast co-owner Barbara Groom said Monday that even though she has received positive reviews of the label -- designed by local artist Duane Flatmo -- from other Hindus in the past, and even though her attorneys are confident that they would prevail if the case went to trial, the brewery is in the process of designing a new label. "What is that saying -- the squeaky wheel gets the grease?" she said. BRIEFCASE RETURNED: A briefcase containing French train tickets and information for a 20-student class trip to France was found, said Marceau Verdiere, a teacher at the Northcoast Preparatory Academy of Arcata, who organized the trip. The briefcase, which was stolen May 2 out of Verdiere's unlocked truck at his home in Blue Lake, was found near the post office then turned over to the theater school Dell'Arte -- who else in Blue Lake would have a connection to France, the finder probably figured -- and the school turned it in to police. All of the contents were intact. THE APPLE, PLEASE: Eleven Humboldt County teachers were scheduled to be honored Wednesday at the annual Excellence in Teaching and Jean Olson Career Achievement Awards presentation at the Adorni Center in Eureka. The recipients in the first category: Mindy Fattig of McKinleyville Middle School, Robin Gray-Stewart of Washington School in Eureka, Anne Hartline of McKinleyville Middle School, Barbara McDonald of Ferndale Elementary School; Ken Pinkerton of Zane Middle School and Sheryl Steiner of Monument Middle School in Rio Dell. Recipients of the career achievement awards were Diana Heberger of Garfield School, Kamila Huff of the Humboldt County Office of Education Community School, Kennith Merideth of Eureka elementary schools and his wife Patricia Merideth of Winship Middle School, and Paula Parodi, who recently retired from the Cutten Elementary district. The awards are presented by the Humboldt County Office of Education. Congrats to them and all great teachers! TOP KID ESSAYIST LAUDS GALLEGOS: Congratulations to Kevin Zhou, 11th-grader at Monte Vista High School in the Bay Area town of Danville. Late last month, Zhou was named as one of two winners of the annual "Profiles in Courage Essay Contest," a program of the John F. Kennedy Library Foundation, for his essay on Humboldt County District Attorney Paul Gallegos' lawsuit against Pacific Lumber and last year's recall attempt against him. Locals may quibble with some of the facts asserted in Zhou's eight-paragraph essay -- he identifies then-Fortuna Mayor Mel Berti as a "long-time supporter" of the DA and baldly states that Gallegos' home was broken into twice during the campaign (an allegation that was never proven) -- but he seems to have absorbed some of the fervor that Gallegos supporters exhibited during the recall. "District Attorney Paul V. Gallegos' courageous actions marked a turning point in the dominance of the timber company's interests in the county, and reflect a man who was willing to act on principle and not politics," Zhou writes. The kid is on a roll -- earlier this year he won an essay contest sponsored by the United Nations Association, and he picked up honors in last year's National Peace Essay Contest. On Monday, Kennedy's daughter Caroline will present Zhou with a silver Tiffany lantern -- representing a "beacon of hope" -- at a ceremony in Boston. DISC GOLF FOR WILLOW CREEK: A new disc golf course opened in Willow Creek on Saturday as a part of a larger park called Creekside, created with funds from the 2002 Safe Parks Act. General Manager Steve Payne of Willow Creek Community Services District said that the land located on Willow Road was purchased from Pat Murphy of Murphy's Market for $170,000. It cost about $5,000 to acquire and install 10 baskets and signage throughout the park. The park will also feature a playground and BBQ areas. 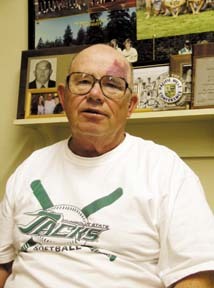 Humboldt State's "Winningest Coach," Frank Cheek, who reached 800 career softball wins this season, talked with the Journal last week about his 36 years coaching wrestling and softball at the university, and the possibility of retirement. After clinching the Greater Northwest Athletic Conference title last week, Cheek, 67, leads the top seed HSU women's softball team into the Western Region Championships this weekend at CSU Dominguez Hills, and then, he hopes, on to the NCAA Division II championships in Salem, Va.
Journal: In your youth, were you a wrestler or baseball player? Cheek: I was a baseball player and a football player. Kentucky [high schools] at that time did not have wrestling. When I was 17, I went into the Marine Corps and I played baseball. And this wrestling team was working out, and I kinda liked it. So I went over and started playing around with them, and I got beat up pretty good. Well, that made me mad. I mean, I always thought I was a pretty tough hombre. So I went back the next day, and the next day, and I started working out. Then I went to San Francisco State and wrestled there. I [hurt] my arm my junior year wrestling a kid from Stanford. We won the match. Actually it was the loss that I felt was really one of my greatest victories. Early in the first round the guy threw me and I separated my shoulder. My coach wanted to throw in the towel. I said, "No, I can finish the match." I was hurting pretty good, and in those days you wrestled nine minutes not six minutes, so for the next six minutes I sucked it up and took my punishment. He was tough and he beat me but he didn't pin me. If he had pinned me, or if we threw in the towel, we would have lost the match. We beat Stanford 17 to 16. So my loss was my greatest victory because beating Stanford in those days was a big win. In losing I felt pride. Journal: Have you ever had an athlete make a similar decision? Cheek: Oh definitely, all the time. I find no difference between the desire to win between men and women. And I've coached men for 22 years, and women I think for 17 [years] so I can speak pretty authoritatively on that. There's no difference in their tenacity or their dedication -- none. Journal: Some people say, "It doesn't matter if you win or lose, it's how you play the game." Do you abide by that credo? Cheek: Well, that was said by a loser, not by a winner. You don't hear winners say that. I feel that winning and losing is everything and if you don't take that approach how can you demand 100 percent if you're not giving 100 percent? People who come up with those clichés -- it's nice on paper but in my case, winning is everything. Winning is everything. Journal: So when you entered the season, were you thinking, "We might reach 800 wins this season?" Cheek: I know that the numbers will take care of themselves. I live in the future, not the past. Mike Ditka was a great football coach and a reporter once said, "[Ditka] knows the difference between six inches -- a pat on the back and a kick in the rear end." I actually don't kick the girls. I kick the wrestlers. Some ladies need a little more motivation than others. There's one young lady who has a tendency to try and bunt rise balls. So you tell her, "Don't bunt the rise balls, you don't wanna bunt rise balls." You finally have to say, "You bunt another rise ball you're gonna run to the [outfield] fence." Well, running to the fence seems to work better than telling them, "Don't do it." There is a saying from Proverbs that I like, I wrote it down Proverbs 20:30, "Sometimes it takes a painful situation to make us change our ways." I believe that. Journal: How, if at all, has your coaching changed over the year? Cheek: Oh, it's changed dramatically. I'm from the old school, they have the hard heads and the ultra modern; well, I'm a hard head. There's no doubt about that: Just blood and guts -- your blood and my guts, you know what I mean. And the coach is in charge. I am not your friend on the field. I'm a dictator. I try to be a benevolent dictator but I'm a dictator out there. You don't ever question me on the field, ever -- not even my assistant coaches [question me]. You just do what you're told. We can't have a girl rounding second and I say go home and she says, "Well, let's stop and think about this." You can't do it. But they can come into this office and talk all they want, and they do that. Once the ladies realize that I'm on their side, and that my bark is worse than my bite, I believe that we have a pretty good relationship. So I've learned to be nice but I'm still from the old school. You don't question my leadership. Journal: After so many winning seasons, is it hard to keep your athletes from becoming overconfident? Cheek: I like my players to feel somewhat arrogant. I like them to be assertive. I like them overconfident. I don't want them going into a game thinking they haven't covered everything. I want them to go in the game positive. "Don't Tread on Me" -- that's the Kentucky motto. And I believe in that. When we walk on the field we are all business, there's no horseplay, they've got their game face on. When we walk off the field and get in the van then they can do what they want as long as we win. If we lose there shouldn't be a word said. Losing hurts. We work too hard to lose. Journal: Are you planning to retire? Cheek: I'm leaning that way. The thing is that if we were losing it would be very easy for me to walk out that door. If I thought this team didn't want me, I'd walk out that door. If you had asked me a year ago, I would have said I was retiring. Now it's getting down to the nitty-gritty. I'm going to have my knees operated on. It's difficult for me to stand on my feet for three hours. It hurts. I'm going to get knee replacements. Actually it will help my personality because if you're in pain and you're out there on the field and something happens, all of the sudden you respond inappropriately because the pain makes you irritable. But I'm still having a good time, the team is winning, I have a great bunch of girls. Journal: What are your retirement plans? Cheek: What will I do? I haven't the faintest idea. What would I rather do? There is nothing I would rather do. I'd enjoy some time to cut my grass and paint the house and take my wife to lunch and go down [to Livermore] and see my daughter and my grandson. I enjoy that. He's 7 and my daughter and her husband are coaching him. I'd like to see him play [baseball] because he's family. But you know what? This [team] is my family. LET'S FACE IT. THE IDEA OF PEOPLE DANCING WITH DOGS IS FUNNY. But, for members of the World Canine Freestyle Organization, dancing with dogs is a serious sport. Over the past few years, canine freestyle has grown in popularity in the United States, Canada, England, Denmark, Japan, South Africa and as far away as Australia. Canine Freestyle performances feature theatrical musical routines, with dog and handler each playing/dancing characters from plays, musicals or pop songs. 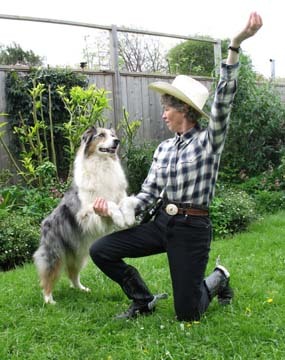 Techniques include paw kicks, walking backward and weaving through the handler's legs to the music. The techniques are incorporated using movements dogs enjoy naturally. Competition routines can range from shuffling along to a cool Patsy Cline tune to full-on battles between canine and human gladiators set to dramatic classical soundtracks. Competitors use all kinds of musical styles, and the dogs come in all shapes and sizes. Hey, if the West Nile Virus can make it here, why not doggie dancing? In Humboldt County, there is one person who dances with dogs professionally, so far: Diana Kriger. Although quite bashful about exposing her involvement with Canine Freestyle -- rebels don't come any shyer -- Kriger, 53, of Redwood Valley (east of Blue Lake) is for now the only local participant in what has become a worldwide phenomenon. Originally from Southern California, Kriger has lived in Humboldt County for 34 years. When she isn't busy dancing with dogs, she works as a purchasing agent for Holly Yashi in Arcata. "Most freestylers have a sense of humor," Kriger says of her involvement with World Canine Freestyle Organization. "Many people initially look puzzled when I tell them I dance with my dog, but that's part of the fun of it. Those who are intrigued enough to find out more about it usually end up with a smile on their face. "My first real close and personal experience came when I attended a freestyle workshop in Oregon given by Caroline Scott from Texas in 2003," she continued. "This is truly a sport for all ages. Young children can and do compete, and I've seen some incredible routines performed by elderly handlers and elderly dogs. It's really a spectator sport, so it's really hard to capture that in words." 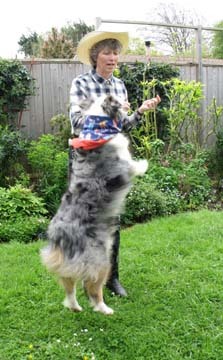 Kriger's primary dance partner is her rambunctious Australian Shepherd, Zip. So far, she and Zip have performed in two Canine Musical Freestyle titling competitions. Her first was in Corvallis, Ore., in 2003, and the second was earlier this year in Santa Rosa. She hopes to compete in Klamath Falls, Ore., this July, and again in Corvallis in November. Kriger belongs to the nearest freestyle group, Redwood Empire Doggy Dancers, based in Santa Rosa. So far, Kriger and Zip have two routines, "Locomotion" by Little Eva, and "Jingle, Jangle, Jingle" by those kidding cowboys, Riders in the Sky. During this performance, Kriger does a little Texas two-step routine, while Zip weaves through her legs, spins and twirls 360s, and dances on two legs. For competition, each choreographed step and movement must integrate with the song, from start to finish, to get high scores. In all, Kriger has four dogs: two Australian Shepherds and two border collies. All the dogs have competed with Kriger in dog agility competitions, and all four are learning freestyle. "The training process is so much fun for the dogs that none of them want to be left out," Kriger says. "One of the nicest things about training freestyle moves is you can do it inside the house. When I learned about freestyle, I thought it would be something that Zip would enjoy and that I would enjoy. The best part is the people that you meet. Everybody involved has a real happy-go-lucky attitude. It's all for fun." There is a lot of legwork in canine freestyle -- such as standing up, which can be hard on dogs' legs -- and older dogs may find it difficult to endure. However, routines can be adapted to accommodate most animals. Freestyling with Zip, Kriger says, is a healthy retirement activity for the 9-year-old dog. "It's good to get out with him and work hard, and do things that mentally stimulate him, and give him something to do that isn't hard on his body. They [judges] don't mind an older dog. You get scored on the technical abilities of the dogs, so it's really helpful if they are athletic." Kriger says the hardest part for new dogs is training them to focus on the handler for the complete length of the performance without getting distracted by the audience. Although food bribes can be used in training the dance animals, no such treats are allowed in a competition. The dogs must perform with their trainers because they want to. Will there ever be a competition here in Humboldt County, or are we too unsophisticated? According to Kriger, it takes a lot of hard work to put on a title competition, and the first step to having a competition in our area is to form a canine musical freestyle club of our own. "Humboldt County has many talented dog trainers," Kriger insists, "who could easily become world class Freestylers." What's next? Canasta with cats? For more information on canine freestyle, and uproarious videos of competitions, go to www.worldcaninefreestyle.org. John Dooley is an Arcata poet and free-lance writer.